Physical leavening involves physically forcing air into a batter or dough. This is what happens when you cream together butter and sugar. Little air pockets are created, which give volume to the baked good. Another example is incorporating air into egg whites. Sponge cakes are leavened this way (most traditional sponge recipes do not call for baking powder.) Egg whites are whipped until fluffy and the remaining ingredients are folded in, keeping as much air in the batter as possible. Most cookie or cake recipes will call for either baking powder or baking soda. When I was a kid, I remember substituting baking powder with baking soda in a pancake recipe. My reasoning was that they looked the same, and their names pretty much sounded the same. Let me tell you, from experience, that they are not the same. The 3 products of the reaction are a salt, water, and carbon dioxide gas. The carbon dioxide gas is what we want in our baked goods. When you add baking soda to a dough or batter, the baking soda reacts with any acids present (buttermilk, cream of tartar, lemon juice, etc.) and the resulting carbon dioxide gas creates little air pockets in the batter. 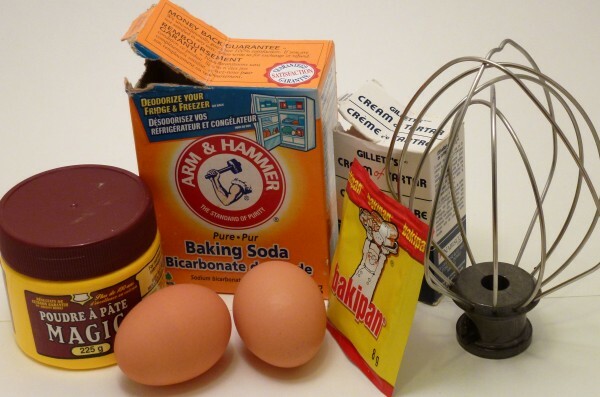 Baking powder is different from baking soda because it contains both an acid and a base in one powder. Get this powder wet, and the acid and the base will react with each other in the same way that sodium bicarbonate will react with an acid. This is actually a good way to test if your baking powder is working properly: add a bit of water. If it fizzes, you know it’s working. The fact that baking powder works on its own means that you can substitute baking soda with baking powder. You cannot, however, substitute the other way around. Let’s say you had no baking soda in the house and were in the middle of a recipe that called for it. You could add baking powder instead, although you would need to add a bit more (e.g. 2 teaspoons of baking powder to replace 1 teaspoon of baking soda.) Now if your situation was reversed and you went to reach for some baking powder, realizing all you had was baking soda, what could you do? Since baking powder is an acid and a base, you would need to think of an acid and base you could use as a replacement. Baking soda and cream of tartar, for example. One thing to keep in mind, if you make your own baking powder this way, is that baking soda can leave a bitter taste in baked goods if you use too much. A good substitution is for every 1 tsp. of baking powder use 1/4 tsp. of baking soda, and 1/2 tsp. cream of tartar. Biological leavening refers to using living organisms to leaven dough. Baker’s yeast, or Saccharomyces cerevisiae, is a fungus that has been used for centuries to make bread and wine. When people first started using yeast, they were unaware that they were using living creatures to make bread. The yeast cells leaven dough by eating some of the glucose present and excreting its waste products (alcohol and carbon dioxide gas.) This happens at a much slower rate than the reactions with chemical leaveners, which is why we let bread dough rise for a while before baking. In addition to all the leavening agents mentioned, steam plays a role in ALL baked goods. I talked about this role in my puff pastry post, but there are many other baked goods that rely on steam rather than chemical leaveners. Some good examples are pita bread and yorkshire puddings, both of which have huge pockets created from steam. When the water in the dough turns to steam, the H2O molecules begin to spread out and take up way more space. This forces the dough or batter to expand.